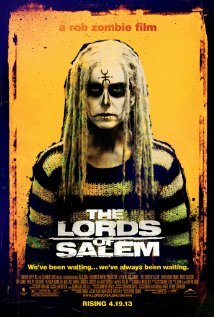 Anchor Bay Films releases The Lords of Salem in select theaters April 19th, 2013. Rob Zombie: Well, my thought on that was always the characters. Any horror movie that people talk about tends to have some iconic character that they remember. It could be Frankenstein or Jack Torrence from The Shining. I think that that gets forgotten sometimes. The 80's had that for a while: Jason, Eddie, Freddy, whatever. And then the 90's became more about situations and teens in peril, but nothing memorable. They were trendy, of-the-moment situations, but nothing would pop out of that. Sometimes all that people need is one particular image to hang their hat on and then they'll remember it. NYC MOVIE GURU: Which film(s) still scare you until this very day? RZ: The Shining is a good example of that. When I saw it when it first came out, it seemed so intense and amazing. Over the years, I'd always watch it again on television and realize the greatness of it, but it didn't seem scary anymore. I saw it again last year on the big screen again and realized the impact of it. Nowadays, people would say that a film didn't seem scary. Why? Because they watched it on Youtube. They're not getting the impact--it's like listening to music on your phone. NYC MOVIE GURU: At what point in your life did you know that the horror genre was meant for you? RZ: I don't really look at it that way. I always loved all types of movies. Horror movies popped up in a predominent way because in the late 60's, when I was a kid, there was like a horror boom in general. As a little kid, it all just appealed to me. That's how all of it started. NYC MOVIE GURU: Roger Ebert once stated that horror movies don't need big star because the horror is the star. Do you agree/disagree? RZ: I think that that's probably true to an extent or completely true. In fact, I find sometimes that if you have a big star in a horror movie, it's almost distracting because it makes the movie feel safe. There have been movies like, say, Texas Chainsaw Massacre. You watch the movie, it's all unknown actors, and it makes it feel so real. But a lot of times, when they update those movies, they fill in those slots with recognizable actors which doesn't make it feel so dangerous anymore. But then there's The Shining with Jack Nicholson or Rosemary's Baby with Mia Farrow, so it can work either way. I think that back in the day it wasn't so weird because those were A-level movies with big stars. It can work either way, but you don't need it for sure.